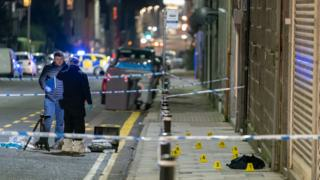 Three people have appeared in court in Aberdeen charged with attempted murder. A 41-year-old man was seriously injured in the incident in the city's George Street on Tuesday evening. George Hanratty, 33, Paul Johnson, 27, and Sarahjane Massie, 36, all of Aberdeen, appeared at the city's sheriff court charged with assault to severe injury, the danger of life, and attempted murder.